subways, runs with frequent service to many destinations within the inner urban core. largely at rush hour, and one- or two-hour service gaps between trains at other times. household spending, requiring difficult cutbacks elsewhere. Boston on crowded trains that too often provide unreliable and uncomfortable service. Rail system as a more subway-like service, with frequent service all day. savings over time. This investment would dramatically increase reliability and capacity. Strategic Infrastructure investments to relieve bottlenecks. every 15 minutes in denser neighborhoods. While not critical to implementing a Regional Rail system, the North-South Rail Link (NSRL) between North and South Stations, allowing service between any two stations with either a direct trip or a single, seamless transfer, would be a highly useful enhancement providing the flexibility and connectivity to which many riders and potential riders would be drawn. People who live in the inner core neighborhoods of Boston and Cambridge can ride the subway anywhere, 19 hours a day. Regional Rail can bring the same high frequency of service as the subway to the entire region, at a grander scale. Who benefits from higher frequency? Many people ride to work, not just in Downtown Boston, but also in other job centers. They ride not just for work, but to meet friends and family, to go to school, to run errands, to travel to healthcare appointments, sports events, museums, and other cultural venues. And they don’t just ride at rush hour, but also fill trains in the off-hours and on weekends, even at midnight. A successful public transportation system will respond to the needs, complexities, and preferences of all riders regardless of time of day, purpose of trip, or destination. one important element of the MBTA’s stated objective to increase ridership. Regional Rail that includes the NSRL tunnel also enables people to live on one side of the region and work in another. In northern suburbs, people would get easy access to the Financial District, Back Bay and the Longwood Medical Area. In southern suburbs, they would benefit from access to Government Center and MGH. People could work in suburbs on the opposite side of the region they live in, providing the kind of transit connectivity and work/life flexibility that could be powerfully useful for two-income families, and for people choosing more affordable places to live outside the urban core. Like the subway, Regional Rail is not just about work trips. It would facilitate occasional trips, which are concentrated on weekends and in the off-hours, and which are essential to the economy and to quality of life. Students and academics could visit Brandeis, Wellesley, or UMass Lowell or Worcester for a seminar. Patients could access medical care at the world-class institutions that are clustered in the Longwood Medical Area and at Massachusetts General Hospital. Families could visit museums near stations, including the Aquarium, the Museum of Science, Museum of Fine Arts, and Salem’s Peabody Essex Museum. Sports fans could come from the entire region to the Bruins and Celtics games at the Garden directly over North Station, or watch the Red Sox play at Fenway Park. The better performance specifications of EMUs make them smart investments on their own, as they solve the chronic issue of routine train breakdowns that propagate delays across the system. New EMUs would replace old diesel trains: locomotives that were based on freight locomotive designs. Today’s MBTA commuter rail locomotives fail about once every 5,000 to 6,000 miles, whereas high-quality EMUs are in the 150,000 to 200,000 mile range, and those EMU performance measures are improving. Put simply, EMUs are ~30 times more reliable than the current legacy fleet, and ~6 times more reliable than the newest diesel locomotives. This is why systemwide electrification is such a crucial component of Regional Rail. There is an ongoing debate regarding whether EMUs or DMUs make the most sense for the MBTA rail system. For a number of reasons, EMUs are the clear choice. The strongest argument for deployment of DMUs is that it doesn’t require electrification of the system, and therefore can be more quickly implemented. There are benefits that come with a speedier rollout, but they pale in comparison to the downsides of embarking on a DMU strategy. Investments of this importance and scale should be made in the most cost-effective and environmentally friendly manner possible. The performance of DMUs over time is simply not on par with EMUs, and unlike EMUs, DMUs require intensive, costly maintenance. Adoption of DMUs as a permanent strategy takes us in the opposite direction of other developed countries and commits us to more costly, bespoke procurements for the duration of the MBTA’s commitment to DMU technology. Leasing DMUs in the short term as a way to immediately improve service on a few designated lines prior to their electrification (like the Fairmount Line or the Worcester line if and when Allston Landing construction temporarily reduces track capacity) may be worth considering. A lease is the only procurement strategy that makes sense because DMUs can’t easily be sold on the secondary market (we know of no agency outside North America that needs American DMUs, and no agency inside North America is making a large DMU order). Such potential short-term uses aside, the most cost-efficient, durable and sustainable investment will be the procurement of EMUs and the electrification of the system. And as we have pointed out elsewhere in this report, EMUs can be up and running almost immediately on the Providence Line. EMUs accelerate and decelerate much faster than trains pulled by locomotives, especially diesel locomotives. The difference is more than a minute per station when the top speed is 60 mph. Together with speed benefits coming from higher reliability and level boarding, Regional Rail would offer higher average speeds. Future all-local trains would be faster than today’s express trains, averaging 30 mph on the Fairmount Line, 43 mph on the Worcester and Franklin Lines, and 50-55 mph on the remaining lines.17 Faster trip times allow the same number of trains to run more trips in a day. In addition to the added capacity of additional trips, this leads to greater utilization rates for capital assets and investment. When combined with higher ridership, the cost per passenger savings of regional rail will be substantial. A significant component of trip time is dwell time, or the time spent sitting at each station. Dwell time is decreased by level boarding from high platforms and by better passenger flow within the train cars. EMUs are designed to maximize passenger ingress and egress (i.e. more and wider doors like a subway car) and as such are almost always specified as single level cars rather than the bi-levels now common on the MBTA Commuter Rail network. Any passenger capacity decreases arising from the use of single level EMUs will be easily offset by the increased frequency made possible by the inherent efficiencies of the modern regional rail network. Regional Rail is a mode for both central cities and suburbs. It holds the promise of strengthening town centers with improved connections to other parts of the region. Because EMUs enable all-local service to still be fast, improvements to Boston’s mainline rail system can and will benefit both urban and suburban users. Investments made in the Fairmount and Providence Lines, for example, would give residents of Dorchester, Mattapan, and Hyde Park access to jobs in suburban towns like Dedham and Norwood, with trains running through to the Franklin Line. Regional Rail transforms the underutilized, underinvested, and niche-oriented “commuter” rail network into something of value to a much broader swath of citizens. We don’t think of our highway system as simply available for peak hour commuting travel. Instead, our roads offer vehicular mobility at all times, not just for 9 to 5 commuters. Similarly, a Regional Rail system provides inbound and outbound rail service to people at convenient times throughout the day. To envision the Regional Rail system at work, think about the transportation system as if it were the human anatomy.18 Your body is constantly circulating blood from your muscles (the region) to your heart and lungs (the urban core) and back. When you exercise (rush hour) it picks up the pace, but it doesn’t bring all your blood into the core and wait until the next time you exercise to send it out again. A healthy body responds appropriately to differing conditions and supports a variety of activities. A healthy transportation system provides the same kind of adaptability, responding to and supporting a variety of mobility needs throughout the day. Regional Rail will be the centerpiece of such a healthy system, a transformational way to extend sustainable, inclusive and egalitarian transit mobility to the entire Metro Boston area. Regional Rail will draw the region closer together. It will provide better job access for people living in working-class suburbs, such as Lynn, Haverhill, and (once South Coast Rail is constructed) New Bedford and Fall River. And it will do so without burdening the air quality in central neighborhoods such as Roxbury and Dorchester. In short, Regional Rail holds the promise of breaking the longstanding city vs. suburb dichotomy in transportation planning and resource allocation. The following examples of regional rail systems across the globe provide important lessons that inform our thinking. While there is no precisely exact analogue to Metro Boston, these examples demonstrate the effectiveness and importance of electrification, high-level platforms and connecting stub-end terminals as approaches to providing riders with a rail service that serves their mobility needs. Note: All dollar figures cited are in US dollars, adjusted for exchange rates and inflation. system, the RER is a useful case study for Boston. Paris historically had six intercity rail terminals and three smaller terminals used only by commuter lines. It had some frequent service starting in the 1920s, but no real regional integration. In 1937-8, Metro operator RATP bought one isolated commuter line, the Ligne de Sceaux, and electrified it and began running frequent service, treating it as a regional Metro line. 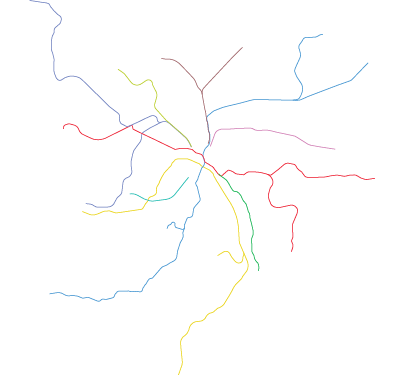 The diagrams to the right show the evolution of the Paris RER network. Paris’ model has been copied worldwide with Commuter Rail transformations in Toronto (RER) and Brussels (RER). In the last two decades, London has also invested in two RER-like projects, both of which run through central London: Thameslink connecting the Brighton Main Line and the Midland Main Line with an unused short rail link, and Crossrail which connects the Great Western Main Line to the Great Eastern Main Line and the North London Line with 13 mi of deep bore tunnels. Predating Paris’s transformation, Philadelphia connected its two legacy Commuter Rail networks, the Reading and Pennsylvania Railroads. Similar to our preferred version of the NSRL, the connecting tunnel is short and includes 4 tracks. Unfortunately, SEPTA did not complete relatively inexpensive complementary capital projects to support more efficient use. The only through-running American rail doesn’t come close to its full potential. They have also begun terminating many trains downtown. Thus, our plan for regional rail and the NSRL would make Boston a pioneer among American transit agencies. In the postwar era, the lack of through-service and the distance of most rail terminals from the emerging central business district became serious enough problems that RATP and national rail operator SNCF began planning for multiple rail links. Nation, a major Metro transfer station. RATP and SNCF cooperated in planning. RATP would route its new tunnels to serve intercity rail stations, and there would be through-service between RATP- and SNCF-owned lines. The RER A, run by RATP, is in red; the east branch is new construction. The RER B is in blue; the Ligne de Sceaux is operated by RATP whereas the northern side, with a new branch going north to the airport, is operated by SNCF. The RER C is in yellow, operated by SNCF. Other lines, still stub-ending at the terminals, are called Transilien. The RER A has a long tunnel going west, serving La Defense, a suburban high-rise business district. Unlike Paris, Boston’s office density in the South Station area enables similar functionality with a shorter tunnel. The green line is RER D, and the magenta RER E, both run by SNCF. The RER E is being extended to the east, taking over some additional Transilien lines and relieving the overburdened RER A. On the RER A, the new east branch now serves suburban jobs in Marne-la-Vallée and Disneyland Paris; a new west branch serves jobs in Cergy. Like Boston, Munich historically had two main stub-end train terminals: Hauptbahnhof (Main Station) and Ostbahnhof (East Station). Passengers transferring between these stations had to use the city’s overcrowded streetcar network. Since 1930 the German term for regional rail, including high frequency and through-running, has been S-Bahn, where S stands for Stadtschnell (city-fast). But whereas Berlin and Hamburg had such systems for decades, Munich would have to wait. There were recurrent plans for underground rail tunnels; a plan for an S-Bahn network from the Nazi era began construction in 1938, with an east-west and north-south tunnel, but the works were suspended in the war and little had been built. After the war, West Germany recovered quickly, and Munich grew especially fast, but infrastructure was inadequate. Plans for both a municipal subway and an S-Bahn run by national railway DB resumed, reducing the S-Bahn to just one east-west tunnel connecting Hauptbahnhof and Ostbahnhof. Both the subway and the S-Bahn began construction in 1965. In the next year, Munich was chosen as the host city for the 1972 Summer Olympics, forcing both projects to accelerate. In the next six years, not only did the region build the east-west tunnel and the first subway line, but also it electrified the commuter lines that hadn’t yet been wired, and lengthened and raised the platforms to allow for long trains, comparable to 8.5-car American trains. To reduce costs, the S-Bahn was not built to the same standards on the outer branches as in the city. Some branches are single-track, and some require S-Bahn trains to share track with intercity passenger and freight trains. Since the system’s initial opening there has been additional construction, but these design compromises still impose constraints on the system’s timetable. To resolve them, Munich invented the clockface schedule, in which timetables repeat regularly all day on a prescribed interval, such as every 20 minutes. Riders began crowding the system. Daily ridership had crept up from 114,000 in 1961 to 160,000 when the system opened, but then reached 250,000 by the end of 1972, 430,000 at the end of the 1970s, and 640,000 in 1987. Today there are 840,000 passengers per day.27 Some lines today run every 10 minutes, combining to a peak frequency of a train every 2 minutes in the central tunnel. Munich rail network trains are very crowded, and as a result, there have been plans to build a second east-west tunnel to add capacity. However, with more underground infrastructure in Munich today than there was in the 1960s, construction has run into schedule and budget overruns. The second tunnel, under construction since last year, is now projected to open in 2026 and cost $1.1 billion per underground mile, the second highest figure outside the English-speaking world (the RER A, at $1.2 billion, is first). At this cost, the NSRL tunnel could be built for $6 billion. Boston had 80 years of head start on Munich in building underground urban rail. It has an opportunity to use NSRL to catch up. Munich’s innovations in scheduling show the MBTA how to run a fast, reliable schedule even with grade crossings and single-track segments on some branches. Conversely, Munich’s one failure, the mounting costs of the second S-Bahn tunnel, presents a strong argument for building a four-track NSRL from the start. It might look cheaper to start with two tracks and then expand to four later, but the lifetime costs would be much higher. Like Boston and Munich, Philadelphia historically had two separate stub-end train terminals: Suburban Station and Reading Terminal. Suburban Station was built by the Pennsylvania Railroad; intercity trains stopped just outside Center City, at 30th Street Station, which offered through-service from New York to Washington. Reading Terminal served the trains of the Reading Railroad as well as other railroads that competed with the Pennsylvania, such as the Baltimore and Ohio. Each station was about a quarter mile from City Hall, where the city’s two main subway lines intersect, but connecting between the two stations required walking the half mile. In the 1970s, with both the Pennsylvania and Reading bankrupt, SEPTA took over both of their commuter rail networks, and began to plan to unify them. Both networks were already electrified, having been wired between the 1910s and 1930s. SEPTA designed the Center City Commuter Connection, a 1.8-mile tunnel connecting the two networks, extending four tracks of the already-underground Suburban Station to the east, with a new Market East station replacing the above-ground Reading Terminal. In today’s money it cost $1.24 billion; if the North-South Rail Link could built at the same cost per mile, it would cost $2 billion. The effect was not as transformational as hoped. The through-service patterns originally proposed were based on European best industry practices, with high frequency on every branch, going up to a train every ten minutes. Unfortunately SEPTA ran trains infrequently off-peak, and fares were set at a premium over bus and subway fare even within the city. This is especially harmful to in-city ridership: several SEPTA Regional Rail branches run entirely within Philadelphia’s city limits, and all have weak ridership, even ones running parallel to overcrowded bus lines. This pattern of stronger ridership in the suburbs than in the city should not surprise Boston-based readers, since the Fairmount Line has relatively low ridership, and had the lowest ridership per mile when it charged premium fares. In terms of size, historic urban form, and transit usage, Philadelphia and Boston are similar. That SEPTA’s partial modernization (through-running and electrification, but no high frequency or fare integration) led to partial success (somewhat lower operating costs and ridership per route-mile) should make Boston more confident that full modernization of MBTA service would lead to full success. With 1.7 million people, Auckland is the largest metro area in New Zealand, and the fastest-growing. Provoked by increasing traffic and the unreliability of aging equipment and infrastructure, it has spent the last decade modernizing its formerly decrepit regional rail system, converting from a mixture of locomotive-hauled trains and secondhand DMUs to modern EMUs, with the full electrified system opening in 2015.29 The region wired about 60 miles of track for NZ$80 million, about $60 million in 2018 US dollars; if the MBTA could electrify for the same per-mile cost, it would be able to wire the entire network for $400 million. Auckland’s experience offers three major takeaways for Boston: 1) Riders respond to provision of frequent, modern service even if there’s no precedent for it, 2) integration of modes—such as Auckland’s commitment to using buses and trains together—is crucial, and 3) The incremental strategy of building ridership through modernization and then immediately committing to the heavier infrastructure lift, the downtown tunnel, is viable; though it will not be ideal, or recommended, in every scenario. For those wishing to read more about Auckland’s experience, the City Rail Link website provides an excellent breakdown and history. 33: We recognize that NSRL faces unique potential cost pressures associated with the highway and transit tunnel infrastructure already in place along the route. boarding and some without; all trains have wide doors and open circulation, permitting short dwell times. The only exceptions observed to the 30-second dwell time rule are the busiest city center stations. At Paris’s Gare du Nord, rush hour trains on the RER B Line, with four pairs of doors per car, have about 500 passengers getting off and 500 getting on; the dwell time is about 60 seconds. Based on this, we believe Regional Rail should have 60-second dwell times at South Station, Central Station, and North Station, and 30-second dwell times everywhere else. Finally, to allow trains to recover from delays, schedules must be slightly padded. In Switzerland, the padding factor is 7%, since the trains are reliable and dwell times are predictable. This is the value we use; in contrast, American commuter operations pad 15% or even more, especially on lines with complex express service patterns. always connect to Back Bay and the Providence and Worcester Lines, and the other to South Bay and the Fairmount and Old Colony Lines. at about 30 trains per hour in Paris, Tokyo, Berlin, and Munich—a train every two minutes. A more typical value, given the extent of branching expected on Regional Rail in Boston, is 24 trains per hour, a train every 2.5 minutes. With ridership growth coming from better service, we expect peak travel demand to be well over 24 trains per hour across all lines entering Boston from the south. We estimate that peak Regional Rail traffic, across all lines feeding South Station today, would be 32-36 trains per hour. Calculating the same figure for the lines feeding North Station is more difficult, because Commuter Rail today has lower mode share on the north than on the south (most downtown jobs are closer to South than to North Station), and NSRL would change this, but total commute volume into Boston is about the same in the northern suburbs as in the southern ones. We do not expect any capacity constraints except on the immediate approaches to North and South Stations, and on some segments shared with other types of trains such as the Providence Line, where any future high-speed rail service would require facilities for timed overtakes with Regional Rail. The state Secretary of Transportation suggested at a December FMCB meeting that electrification could be problematic because of constraints on the signal system governing the minimum spacing between trains. In fact, what we propose has the opposite effect: repeating clockface schedules, with all-local trains, ensures that on the branches, trains are always 15 or 30 minutes apart; even the ancient legacy signals, requiring a few miles of separation between trains, can easily accommodate that. The only problems come from freight trains—but the only significant volumes of freight on the entire MBTA network are on the outermost portions of the Fitchburg and Haverhill Lines; the former (beyond Littleton) could just run trains every 30 minutes even at the peak, and the latter (beyond Ballardvale) is so short and has such slow passenger trains that mixing the two train types should not cause problems. transfers, while North and South Stations should have opposite-direction ones. This means people from the Back Bay portal could transfer cross-platform to the South Bay portal at South Station, for example going from Braintree to Back Bay or from Brockton to Boston Landing. On the north, people could similarly transfer at North Station, for example going between Brandeis and Salem. We include a technical appendix for each of the MBTA’s commuter lines, explaining what needs to be done to upgrade it to Regional Rail standards, and what a future Regional Rail timetable would look like. The speed gains from electrification, top-line trains, level boarding, and the reduced padding coming from better reliability are very large: we estimate on average 40% speed gain, or 30% cut in travel time, even with the addition of some infill stops. the PM—a service pattern that Regional Rail would eliminate in favor of all day equipment utilization.The MBTA should proceed with the understanding that, with increased midday service and a North-South Rail Link, additional investments in expensive core facilities are unnecessary. Boston Engine Terminal(BET), the primary maintenance facility for the commuter rail system, is unable to perform service on south-side trainsets without a long, slow trip through the non-revenue Grand Junction line. With the North-South Rail Link, trains could simply run through from the south side to BET. The Regional Rail network Metropolitan Boston Can achieve. This section analyzes the advantages of potential infrastructure and service improvements for the MBTA’s Providence and Stoughton lines. The shared Providence and Stoughton Line extends along the Northeast Corridor (NEC) from South Station to Canton Junction, a distance of 15 miles. The Providence line segment continues south from Canton Jct. along the NEC to Providence Station, and beyond, to Wickford Junction. This is 29 miles to Providence and another 19 miles to Wickford Jct. Stoughton Line segment extends from Canton Jct. to Stoughton, a distance of 4 miles. The Providence line from South Station through Rhode Island is the only rail line in the MBTA system that has full electrified infrastructure available. Amtrak has expressed interest in the MBTA electrifying Commuter Rail service along the NEC in Massachusetts and Rhode Island. Because the NEC is already electrified, the Providence Line offers the opportunity to almost immediately implement electrified rail service within the MBTA Commuter Rail system. Only short segments, used by the MBTA but not by Amtrak, are unelectrified. The Providence/Stoughton line is the busiest in the Commuter Rail system. The route has over 13,000 passenger trips in each direction every weekday. The current travel time for 43-mile route between Providence and South Station can typically take 70 minutes. 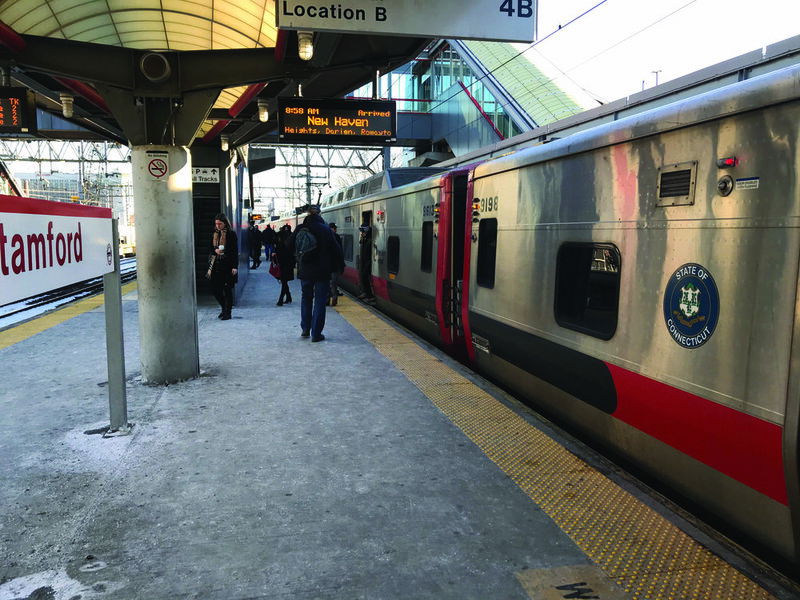 Eight stations only have mini-high platforms, which are about two-thirds the length of a typical coach: Hyde Park, Canton Jct, Sharon, Mansfield, Attleboro, South Attleboro, Canton Center, Stoughton. Those stations have to be equipped with full-length high platforms; the other stations already have high platforms. Between Boston and Providence, a distance of 43.6 miles, there are ten stops. But the potential time saving is substantial for how wide the stop spacing is, because the current MBTA rolling stock generally has a maximum speed of 79-mph, whereas much of the NEC rail line in Massachusetts and Rhode Island has speed limits of 100-150 mph. Rhode Island is currently investing in an infill stop in Pawtucket. We believe that two more locations for infill stops are warranted: Readville, and Forest Hills. Both have stops on other lines branching off the NEC (Franklin and Needham, respectively), but would be useful on the Providence Line as well: Readville for transfers to the Fairmount Line, and Forest Hills for connections to the Orange Line. Capital investment along the NEC south of Massachusetts would be the exclusive responsibility of Rhode Island. Within Rhode Island, there are unfunded long-term plans to extend the line even further south than Wickford Jct., into Kingston and Westerly at the border with Connecticut. The state’s rail plans are compatible and complementary with Regional Rail. MBTA subway and bus, and GATRA, BAT, and RIPTA bus service should have full fare integration with Regional Rail along the Providence/Stoughton lines. RIPTA should expand its current free transfer policy for MBTA pass holders to full fare integration for all Regional Rail fare products; a trip on a Regional Rail train within Rhode Island should cost the same as a RIPTA bus ride. For more frequent Providence and Stoughton line service, trains should run equally at all times of day in both directions. Before NSRL opens, trains should use two captive tracks at South Station and shuttle back and forth, turning back within ten minutes to avoid congesting South Station tracks. With implementation of the NSRL there would be no need for extended dwell times at South Station as trains would potentially travel beyond to the north side of the MBTA system. Generally, trains should operate between 5 am and 1 am, 7 days a week. Scheduling should be consistent with recurring clockface times. Frequency should be the same for both inbound and outbound trains. The top speed should be 100 mph or more, except where constrained by track geometry. Positive Train Control, which prevents overspeed incidents, is installed and active on the line. modification, perhaps a full minute. for the MBTA’s Fairmount Line, proposing upgrades and changes along its corridor. The Fairmount Line runs just over 9 miles from South Station to Readville, primarily through the Dorchester, Mattapan, and Hyde Park neighborhoods of Boston, with seven urban stations open and an eighth under construction at Blue Hill Avenue/Cummins Highway. The Fairmount Line has already had considerable upgrades to its infrastructure, with many bridges replaced and high-level platforms installed at all stations other than Fairmount and Readville. At both ends, the line connects to the Providence Line, which is already electrified. Thus, it does not need electrical substations; electrifying the line merely requires stringing wire and connecting it to the Providence Line’s substations. Electrification is a priority, especially given high levels of air pollution in Dorchester from sources like the congested Southeast Expressway in addition to the current Commuter Rail diesel locomotives. The southern end of the line is closely parallel to the 28 bus, which runs along Blue Hill Avenue. The 28 is in a near-tie for busiest bus route in Boston; it is crowded at rush hour, despite averaging only 8 mph. Faster trains would connect passengers in Mattapan to Downtown Boston four times as quickly as the 28 bus with a transfer to the Orange Line. The Fairmount Line is unique among MBTA Commuter Rail lines in how urban it is. It connects South Station with 7 other stations, with an eighth station under construction at Blue Hill Avenue. All stations on the line are in the City of Boston, and all except the outermost two, Fairmount and Readville, have full-length high platforms built in the last few years as part of the modernization plan. Because the stations are so closely spaced, the Fairmount Line should be the top target for electrification, alongside the already-wired Providence Line. The difference in travel time between EMUs and trains pulled by diesel locomotives, about 60-90 seconds per station, is much more salient on a line with 8 stations in 9 miles than on a line with a station every 3 to 4 miles. Electrification and the use of EMUs will have many benefits for the Fairmount Line, including reducing emissions to zero, but the most important benefit will be the ability to have a high frequency service that truly behaves like a high functioning subway system. The line’s urban setting also means that high frequency is imperative. A train every 30 minutes could work in cities and suburbs like Providence or Worcester, where the trip time to Boston is an hour. In Dorchester, higher frequency is nonnegotiable. Equally important are good subway and bus connections. One ticket should be valid on all trains and buses within Boston and inner core communities (such as Cambridge and Revere), allowing people to transfer from the Fairmount Line to the Red Line at South Station, the 28 bus at Blue Hill Avenue, or the 23 bus at Talbot Avenue without paying an additional fare. High platforms at Fairmount and Readville to speed boarding as well as permit EMUs without trap doors. The terminal at Readville, on a grade-separation over the Northeast Corridor, is singletrack. It is possible to schedule trains every 15 minutes with a single-track terminus: in Vancouver the SkyTrain Canada Line has single-track ends at both of its outer branches, each having a train every 7 minutes at the peak. However, this imposes operational constraints elsewhere on the line, and so it may be desirable to double-track this terminal. The Fairmount Line opened together with the Franklin Line as part of the New York and New England Railroad. Today, the Franklin Line goes between Readville and South Station along the route of the Providence Line, which offers a faster trip. However, optionally, the Fairmount Line and the Franklin Line could be reconnected, to offer direct service between communities in Dorchester and Mattapan and retail job centers in Dedham and Norwood. If there is through-service, then some additional work is needed. Most of it is on the Franklin Line, but some is on the Fairmount Line: the Readville track would need to be double-tracked. The additional travel demand coming from Dedham and points south is such that peak frequency should be a train every 7.5 minutes. A single-track station at Readville would then be impractical, because it would excessively constrain operations elsewhere on the line. At full rollout, with NSRL removing the slow terminal tracks into South Station, a fast schedule is feasible, almost doubling speed from today. Trains would go at 60 mph from South Station to Blue Hill Avenue, and between Blue Hill Avenue and Readville they could even reach 80 mph. This sample schedule assumes no through-service with the Franklin Line. Americans with Disabilities Act passed by Congress in 1990 ensuring egalitarian access to buildings, transit, and public services for people with disabilities. Scheduling in which trains (or buses) repeat precisely every fixed interval. For example, if an inbound train leaves your station at 9:50 am under a 20-minute clockface schedule, then an inbound train will leave your station at :10, :30, and :50 every hour making the exact same stops. Diesel Multiple Unit, a train that runs using diesel engines to self-propel each individual railcar. A plan currently being considered by MassDOT which would expand the South Station stub-end terminal to 20 tracks, with an estimated cost of $2 billion dollars. If built, the expansion would hinder the potential to implement regional rail service. The outer end of one branch still runs DMUs, although electrification is actively under consideration (the other alternative being EMUswith an added battery system that can run off-wire). We recognize that NSRL faces unique potential cost pressures associated with the highway and transit tunnel infrastructure already in place along the route.